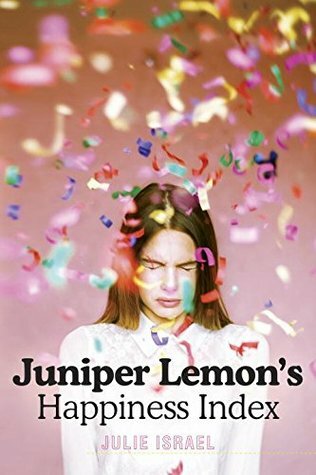 Sixty-five days after the death of her older sister, Juniper Lemon discovers the break-up letter addressed to “You” Camilla wrote the day she died. Juniper is shocked—she knew nothing of her sister’s relationship, and now the hole Camilla left in her life feels that much bigger. She’s determined to uncover You’s identity and deliver Camie’s letter. Maybe, just maybe, that would help fill the sister-shaped void Camilla left behind. 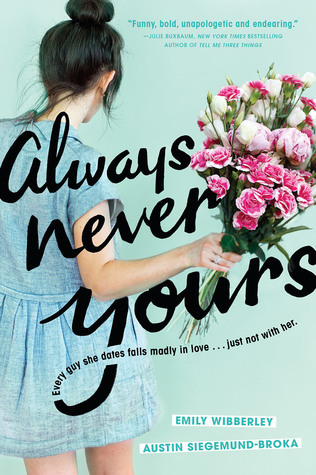 But what Juniper doesn’t expect is that the search for You will lead to learning other people’s secrets: private crushes, shames, fears—or that these secrets will connect her to classmates she never thought to reach out to before. Classmates like the destructive but strangely magnetic Brand Sayers. The biggest surprise? Wading through everyone else’s problems may be just what Juni needs to make peace with her own. A few months prior to Juniper and her sister Camilla were in a car accident. Juniper survived with some injuries. Whereas Camilla died. Juniper is still recovering from the loss. Summer has passed and school is going to began soon. After losing Camilla, Juniper also lost her best friend. There’s been a rift between them since the accident. And now Juniper will be attending school without her sister and the support of her best friend Lauren. Upon arriving home after registration Juniper finds a mysterious letter. It’s written by her sister addressed to ‘You’. Juniper is shocked. Juniper told everything to Camilla. Here was proof that Camilla didn’t. Thus begins Juniper’s hunt for ‘You’. Juniper Lemon’s Happiness Index had been circling GR for a few weeks last year. I dismissed it at first, as the cover lead me to believe it was a memoir. After seeing it for so many days I read the synopsis. 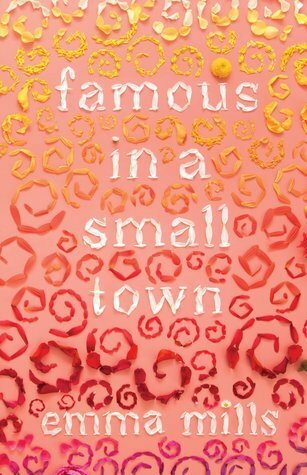 Was surprised to find out that it was a YA book. Out of sheer curiosity I read a sample. I was blown away! And didn’t hesitate to get myself a copy! I am happy to say that I really enjoyed it! The story is written in first person following Juniper’s point of view. There are a table of contents titled ‘Days Without Her’. Juniper’s index card numbers served as the chapter numbers. There are text message’s, emails, essay papers, index cards, diary like entries, and flashbacks. What a refreshing read! I found this so different from you’re typical contemporaries. In regards to the plot, the characters, and the romance. It really becomes clear once you finish it. I really liked Juniper’s character! Her grief regarding Camilla was so well written. It was easy follow her throughout the book. Israel really captured her emotions and thoughts from the very first page. I felt everything Juniper felt. That’s how good it was written. As a request from her sister Juniper has index cards in which she records something she’s happy about each day. This becomes difficult after Camilla’s death. But Juniper still does so. Juniper miss places one of her index cards and begins to worry. She decides to check the garbage at her school for the next few days. Aside from finding typical garbage, Juniper finds some of her classmates secrets. The first thing she find’s is a suicide note from Kody. After some thought Juniper decides to befriend Kody and stop her from committing suicide. She also befriend’s Nate the new kid, Sponge (real name Lawrence) who seems to know everything, Brand the delinquent who is seemingly helping her, and Angela an art nerd. The friendships were done so well! I really liked all off these characters. And they actually all got along. I do think that Juniper’s friend making was questionable, but they were all good for each other. Kody and Juniper bonded over a book series. Angela and Nate were nice to everybody. Sponge was pretty good considering he didn’t say much. Brand was surprisingly insight for Juniper’s situation. They all supported each other and it was great. Now this is how you write good friendship’s. Juniper’s relationship with her family was complicated. Her father was active in her life and supported her. On the other hand Juniper’s mother was never there. As she was grieving she remained in her room and barely participated in family functions. She did get better and actually became a part of Juniper’s life. But it was towards the end of the book. Like most contemporaries there is a bully whose name is Morgan. Now Morgan takes a lot of joy off mentioning that Camilla is dead. The two didn’t get along while Camilla was alive. I do find it kind of unnecessary for the insert bully. But at the same time I didn’t care for Morgan’s backstory. Some people are just mean and don’t have a particular reason for it let alone a tragic backstory. Please be aware that the two get into physical fights. With Morgan always provoking Juniper and Juniper in turn hitting her. I don’t agree with Juniper hitting Morgan, but she seriously should’ve learned the first time not to mention Camilla in such a rude manner. I liked Brand and Juniper’s romance! They did start off as friends of sort. And he was really nice to her. The two made a good couple in the beginning. They also supported each other and called out one-another’s faults. I thoroughly enjoyed Juniper’s character development! She start off annoyingly noisy. I really don’t approve off a lot of her methods. But they were coming from a good place. It is implied from the flashbacks that Juniper has always been like this. Her need to ‘fix’ people. Through her relationships she really begins to grow and let go off bad habits. She decides that Camilla will always be apart of her and stops using the index cards. So that she can actually live her life. I was also really happy about the end events! I liked that Juniper and Lauren were starting to make-up. That they still cared for each other. Lauren’s collage board was brilliant and touching! Even Juniper’s mom coming to her aid. It was sweet. My only problem was that Juniper never found out who ‘You’ was. It really took away so much from the story. As that was Juniper’s main goal and motivation. In a way it did make sense but I wanted a bit more closure. Overall I thoroughly enjoyed this book! I highly recommend it. The Unexpected Everything was recommended to me by my dear friend on GR Mith! Click on her name to read her review. At the time this was coming out I’d already read Matson’s contemporary books. 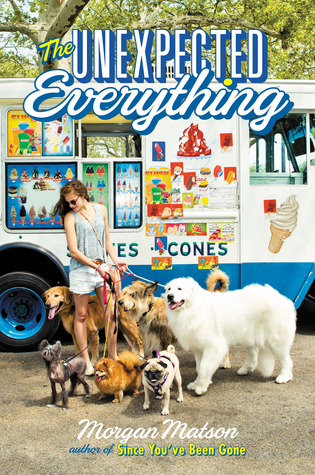 Of course when I heard about The Unexpected Everything I added it to my TBR. I am happy to say that I enjoyed it! I read The Unexpected Everything back in June 2016. I don’t really remember a majority of the details that well. Andie’s fathers campaign has a money scandal. Due to this she can’t participate in her internship program. As that was lined up using her father’s connections. Instead Andie meets Clark and applies for a dog walking job. I liked The Unexpected Everything! Objectively speaking this is Matson’s best work. The Unexpected Everything is written in first person following Andy’s point of view. There are text messages that have emoji’s, books quotes, and flashbacks. The dogs were so much fun to read about! Each dog had his/her own personality. Andie’s job is quite rare in YA. Initially Andie didn’t enjoy the job. She grew to love all the dogs and the job itself. The friendship was amazing! Andie and her friends were so close. They all supported each other. It’s really nice to read a YA contemporary without all the girl-hate. The drama that does happen was realistic and handled well. I like to think that Tody and Bri do make-up. Andie and her father’s relationship is complicated. When Andie was young her mother passed away. Since then her and her father have been distant and barely communicate with one-another. Throughout The Unexpected Everything Andie and her father mend their relationship. It was absolutely beautiful! If you’ve read any of Matson’s books you’ll that she seems to have a love-hate relationship with the fathers in her books. This is evident in Amy and Roger’s Epic Detour and Second Chance Summer. Matson redeemed that in this book. Andie and Clark’s relationship was so cute! They have sort of an insta-attraction when they meet. Initially the relationship didn’t seem likely to workout due to how guarded Andie is. They got an opportunity to open up to each other and that definitely helped. They each grow from their relationship. Andie comes to appreciate her father more based on Clark’s relationship with his father. I especially enjoyed reading about Clark’s relationship with Andie’s friends. My favourite was Clark’s relationship with Andie’s father. Also Clark is the author behind those quotes throughout the book. I didn’t know this in the beginning so I actually tried looking up his name on google. Andie was actually frustrating to read about in the beginning. She was very guarded when it came to her relationships. Specifically of the romance kind. Andie also likes to be in control of everything. Which does lead to the major conflict. 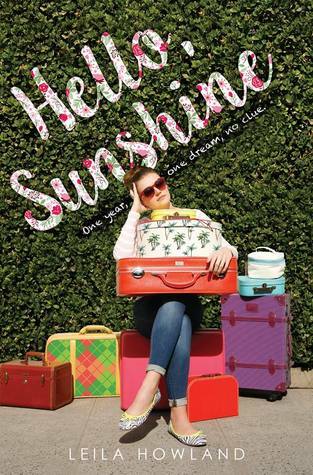 Through her relationships with her friends, Clark, her co-workers, and her father Andie begins to open up more. This causes her to come to some realizations about herself. This is going to get a bit personal so here goes. I saw a lot of myself in Andie. I too like to be prepared and in control of most situations. Once I came to this realization I took a break from blogging. I wasn’t happy that my life had pretty much become about books. I felt way too much pressure about reviewing and how many books I would read in a month. No one else put that pressure on me. I did that to myself. It was a much needed break. And now I’ve come back happy. My only problem was that sometimes it dragged. Honestly there were times while reading that I wanted to sleep. I couldn’t rate it higher because I didn’t love it. While I can acknowledge that it is Matson’s best book, it’s just not my favourite. Overall I enjoyed The Unexpected Everything! I highly recommend it. I have been a fan of Kinsella’s since Finding Audrey. Naturally I went through all of her books and tried to decide which one to read. Can You Keep a Secret? stood out the most. I am happy to say that I loved it! Emma has gone to represent her company Panther Cooperation in a meeting. As per Kinsella books the meeting turns into a disaster whilst Emma spilling a product on one of the other company’s worker. Emma goes back in a bad mood and has quite a bit to drink. The plane she is on experiences turbulence. Out of panic (and she’s drunk) Emma tells all her secrets to another passenger. All’s fine until Emma goes to work on Monday to find out that the passenger is the CEO of Panther Cooperation. Can You Keep a Secret? was so funny and relatable! The writing tense is in first person all from Emma’s point of view. There are numbers for the chapters. As well as emails and notes. I related to a lot of Emma’s work woes. It’s really hard to prove yourself in a workplace that doesn’t appreciate you. Emma’s co-workers like Artemis reminded me off some of my co-workers. There’s always that one person that’s just fake. On the bright side Katie was fun to read about! She was actually really sweet and a good friend to Emma. Emma lived in an apartment with two flatmates. Lissy and Jemima. Lissy has been Emma’s best friend since they were 7. Lissy and Emma constantly support each other throughout Can You Keep a Secret? There friendship was absolutely adorable! I’m a bit conflicted about Jemima. She definitely thought she was helping. But Jemima’s suggestions were terrible. And didn’t really make sense. I do have to give Jemima props for trying to help. 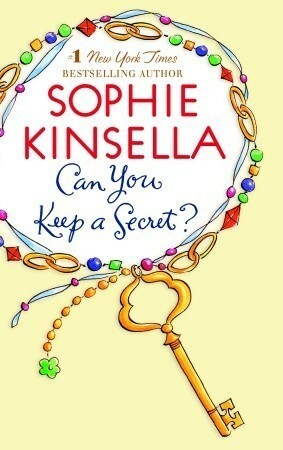 Emma’s family play a huge part in Can You Keep a Secret? Emma feels that she’s disappointed her parents. Her cousin Kerry always tries (and succeeds) to one up Emma. Nev (Kerry’s husband) also pokes at Emma about her career changes. Emma is able to sort everything out with her family. Prior to Can You Keep a Secret? Emma begins dating a co-worker named Connor. Connor works in another division at Panther Cooperation. During the plane ride Emma realizes that she doesn’t really have feelings for Connor anymore. Emma is in denial about this. She breaks up with him much later on. I personally found Connor to be annoying! Emma asks Connor to keep their break-up to himself for the time being. Seeing as they work together. Instead at a party (while drunk) announces their break-up. Their office blames the whole situation on Emma as she is the one to dump him. And he doesn’t even apologize! It didn’t help that the co-workers didn’t bother to see it from Emma’ point of view. Connor also tries multiple times to confront Emma about who she is dating. He acts like a martyr and always has a way of patronizing Emma. I also found him to be totally inconsiderate. To try and look professional during a staff meeting Connor shuts down Emma’s point. Just because Jack Harper was present. I honestly don’t understand why Emma blamed herself for everything. Connor has a brain too. He can realize himself that not all women keep secrets. As far as Emma’s secrets go I didn’t find them that bad. Some of them were really dumb while the others hilarious! What was troubling is how easy it was for Emma to lie. And she did so constantly. Emma did develop and started actually admitting the truth. She even started to stand up for herself! Emma stood up to Kerry and Paul (her boss). I especially liked how she handled Paul. And in the end it paid off as she got promoted. I really liked Emma and Jack’s relationship! When Jack appears in at the Panther Cooperation, he spends quite a bit of time poking fun at Emma’s secrets. It was honestly so assuming! Through their relationship they grew. Jack learned to become more open. And Emma learned to stand up for herself and be honest. They made a really good couple. Also Jack’s actually American. Can You Keep a Secret? takes place in London. I didn’t have any problems. Expect for Connor but I think it was well handled. And blissfully she broke up with him early enough. Overall I loved Can You Keep a Secret?! I highly recommend it. I heard about Chaotic Good through GR. It hasn’t really been that well advertised or talked about. The synopsis reminded me off Moxie which I read and thoroughly enjoyed. I am happy to say that I enjoyed it! Cameron (Cam for short) and her family has just recently moved to Eugene. Cameron is a cosplayer and really wants to get into the university of her dreams. Chaotic Good begins with Cameron shopping in a comic shop where she is harassed by Brody. At some point Cameron gets a paid cosplay request. In order to make the costume properly Cameron has to make another trip to the comic shop. Although this time Cameron will go in as a boy. I had fun reading Chaotic Good! It’s written in first person in Cameron’s point of view. There are chapter titles and a drawing of a dice with the chapter number. Comic strips of D and D are scattered around the book. Also there are text messages and blog posts. I really liked all the comic references! There were so many throughout the book and it really did give the book a geeky feel. Cam’s cosplay costumes were so much fun to read about! Gardner clearly did her research. From the sewing, the fabric shopping. sewing machine terminology, Cam’s thimble collection, and to the costumes themselves. It was fantastic! The D and D role playing was tons of fun! While I have heard of the game I didn’t know anything about it. The characters were so vivid as was the setting. The d-dice was also fun. For some reason I really like that dice. There was diversity! Wyatt was black and gay. And Cam’s twin brother Cooper was gay as well. Lincoln was fat. I liked how Gardner did a good job intergrating these characters into the plot without making their character arc’s only about their diversity. I really liked Cam’s character! I totally understood and empathized with her plights. I liked how well done the idea and the act of courage was done for her story arc. Cam was nice and strong willed. But also had glaring flaws that were realistic. Her character arc definitely gave Moxie vibes and I was here for that. I liked the relationship Cam had with her family! They were all supportive off each other. And some of their lines to each other were so funny. The twin aspect was done well. Cam and Cooper had nicknames for one another. I thought they were adorable! The couples were cute! It was nice that Cam was actually attracted to a fat guy. Cooper and Wyatt also worked well together. The author also did a splendid job exploring unhealthy relationships. Cooper’s ex Farrin (real name is Brian) plays a huge role in his story arc. I felt that it was necessary and not just useless drama. Cyber bullying is a main theme throughout Chaotic Good. Cam get death threats and essentially bullied simply because she’s a female cosplayer. Brody’s character plays a major role in this arc. As he believes that all females are fake and only into geeky things to get attention. I liked how as a boy Cam continuously gave it to him. It is implied that Brody does improve but it’s not really shown. I do some have dislikes. For starters I think that Cam kept up the boy disguise far too long. To a point where Wyatt’s feelings were hurt. I do understand why she donned the disguise but it went on for an unnecessarily long time. Cooper was selfish and annoying. It felt that he turned the boy disguise situation about himself. He was definitely right and he didn’t know everything that Cam went through, but could’ve said it better. While the couples were cute it felt rushed. 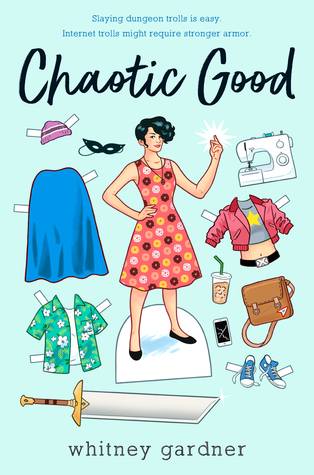 Chaotic Good is a small book that took place over the whole summer. I fell that maybe had it been longer that would’ve made a difference. Chaotic Good is supposed to be empowering for women. But I didn’t get that vibe. When it comes out that Cam is a girl and that Lincoln and Cooper knew, the only person truly blamed was Cam. Wyatt was upset for a short time at Lincoln but that’s it. This really grated on my nerves because I felt that it defeated the whole purpose of Chaotic Good. I really didn’t like how Wyatt and Cooper got together. Cooper glues himself to Wyatt after it comes out that Cam is a girl. He did this to cheer up Wyatt by lending him his shoulder and to also start a relationship with him. This put a bitter taste in my mouth. I’m not saying that they shouldn’t have gotten together. But I would’ve preferred another way for that to happen. While I enjoyed Cam’s character I kind of wished we got a story arc with Brina (Brody’s crush). Brina was so brave! When she came to the comic store she didn’t freeze Brody, nor did she really care what he said to her and about her. Brina would’ve been an interesting main character. Also it is stated that Cam and Cooper are going to be in their last year of high school after summer. Now what I don’t get it why is Cam applying for university this early? I know there are early admissions but I’m pretty sure those start later on. Could someone please clarify that in the comments? Thanks! Overall I enjoyed this book. I definitely recommend it to everyone. Especially if you liked Moxie.